This past Sunday, Matt, me, Mom, and Dad took Michaela to Chuck E. Cheese after church. As usual, she loved exploring and going on the various rides. 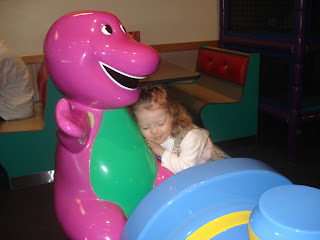 On this day, her particular favorite was the Barney ride. As you can see, she used this time to show Barney how much she loves him.